Paid Firefighters: Are You Being Paid a Living Wage? Dispatchers: Are You Being Paid a Living Wage? Corrections Officers: Are You Being Paid a Living Wage? 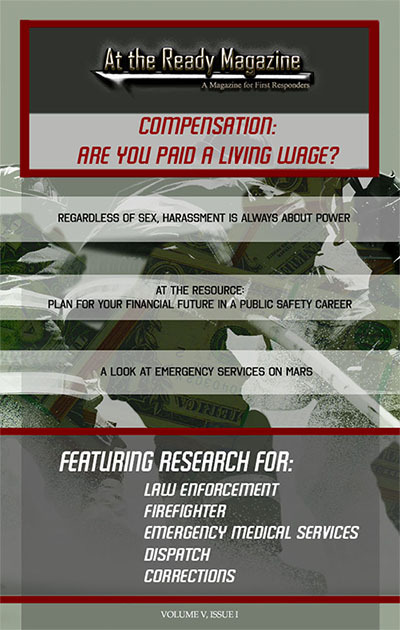 Police and Sheriff Patrol Officers: Are You Being Paid a Living Wage? EMTs and Paramedics: Are You Being Paid a Living Wage? Click each button to see the appropriate content or, to choose an specific issue, click the button above with your choice of publication year, then select the month - this will display all the articles in that publication. The page won't reload, only the content in this space, make sure to scroll down to find it. Once each issue type is displayed - and it should take only a split second - you may click the links below to read more of each article and enjoy! Small Agencies, Is a K9 Unit Right For You? What do you do to “unwind”? Get your FREE Subscription to At the Ready via Email! Course for First Responder Agency Executives Announced for the 2014-2015 Expo Series! Mass Casualty Bus Accidents - Are You Prepared? 911 Response Times: Could a Technology Revolution Be at Hand? Liability and Emergency Driving, Are You Covered? Fleet Management - on THIS budget!? Drive it Until the Wheels Fall Off? Are You Kidding Me? Social Media in the workplace, Is it a good thing or bad thing? Well, I believe it’s about policies and perspective. Earthquakes: How Prepared Can You Be? Why a Standardized Acquisition Approach? Are You Prepared for Anything? GIVING BACK! Programs and Involvement from our community First Responders! Should Your Agency Form a Non Profit Organization? For First Responders, Are Unmanned Aircraft Systems For Video Only? Sending Your Scene Size Up with Live Video Streaming? Do Fire and EMS Personnel Need Body Armor? Who is the 'Real' Terrorist in the U.S.? The 400 Ft. View- Installment 3 Part 1 Integration Into UAS Public Safety Responses "Gut Check"
The 400 Ft. View- Installment 3 Part 2 Integration Into UAS Public Safety Responses "Gut Check"
Virtual Reality: A Neat Thing for Your Phone, An Important Tool For Mine Rescue? At the Ready Thought Leadership- Not My Job, Or Is It?